Kemco Inc. Specialty Contractors, established in 1989 by Mike Kemna, has decades of waterproofing experience providing full Waterproofing Services such as Caulking, Acrylic Coatings, Traffic Coatings, Expansion Joint Systems, Penetrating Sealers and Water Blasting, just to name a few. 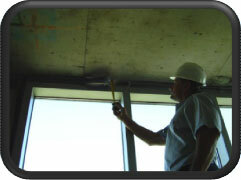 We perform our services anywhere, anytime there is a need for waterproofing in the commercial construction industry. Whether it is new, existing, or restoration services requested, Kemco Inc. has the man power, materials, and equipment to get the job done on time and within budget. From below grade to above ground, Kemco Inc. proudly serves the commercial construction industry with quality products and services while working along with building owners and contractors as applicators for their waterproofing needs. Our experience combined with our services has made us a recognized company in the construction industry. Kemco Inc. takes pride in providing experienced dedicated personnel with over 70 years of combined construction experience who are able to provide quality workmanship at the lowest possible cost to our customers.